£6.50 Stock : 0 Availability: Currently out of stock. Westcounty Lupin Collection. 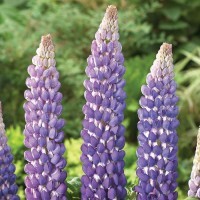 Delightful variety with lagoon blue, flecked with white flowers , it will liven up any border or container. Loved by bumble bees and butterflies. Height 60cm. Full sun / part shade. Can be grown from: seeds or cuttings. Propagation: by seed for species when fresh in autumn, and forms by cuttings from non-flowering side-shoots in spring or early summer. by seed when fresh in autumn, selected forms by cuttings from non-flowering side-shoots in spring or early summer. Soil conditions: Moderate fertility, peaty, well drained limy soil.